In our recent live Facebook Q&A, Neutering Manager Jane answered queries about stray and feral cats. If you missed it, here is a roundup of some of the topics covered. Question: I have a cat that was feral – I found her when she was a kitten. I had her neutered and chipped but she still wanders. I think someone else is feeding her as she is away for months and I only get her back when she is scanned for her microchip and returned. This has been happening for about two years. She doesn’t get on with my other cats and although she used to love my dogs, the two older ones died around the time she went missing. I wonder if this is why she does this? Answer: It might be possible that the passing of your dogs caused this change in her behaviour. Not getting on with your other cats is quite possibly also an issue for her. You have done the right thing in getting her microchipped and making sure she is identifiable. 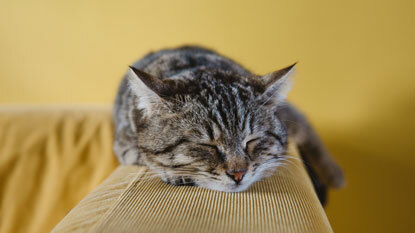 For more advice, take a look at our leaflet on cats living together. Question: A couple of months ago there was a stray on the estate. I was able to befriend him and with Cats Protection’s help, he was neutered. The vet said he was about two years old, but had not been microchipped. He is now part of the family. About two weeks ago, another stray was in the area and was fighting other cats. He has also not been neutered. He has become very friendly too although he is quite nervous. I’m not sure what to do. No one on the estate knows who they belong to. Can you advise? Answer: As no one on the estate knows him or his owner and he is a nervous cat, the best thing would be to make sure he is neutered. He will then be OK living outside if he has a food and shelter source. Call our National Information Line and we can give you further advice. Call 03000 12 12 12, Neutering option. Mon-Fri, 9.30-1pm. Thank you. Question: How should you catch a feral cat to neuter them? Answer: It is best not to do this yourself if you have never been trained how to do it properly. If you have cats that need trapping, neutering and returning, our advisors can give you advice as to your nearest form of help. 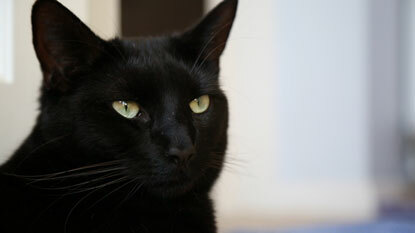 Please call the National Information Line on 03000 12 12 12, neutering option, Mon-Fri 9.30-1pm. Thank you. Question: There has been a male cat coming to our communal gardens for over a year. He is small and thin but his fur doesn’t look particularly manky. He used to spray everywhere and be very vocal when there was a female cat living nearby – she has moved now so he never makes a sound, apart from when I put food out. I tried putting out a paper collar and there was no response. What should I do? Answer: You have obviously tried to find a potential owner, which is great. From what you’ve said, I assume he is friendly and you can handle him easily. If this is the case and you feel you could get him to a vet to be checked for a microchip, this would be the ideal next step. If no chip is found, call our helpline and one of our advisors will give you the best means of help close to you to get him neutered. This is the best thing to do for his overall welfare. As long as he is receiving food and shelter and gets neutered, these are the priority. The National Information Line is 03000 12 12 12, then neutering option. Mon-Fri 9.30-1pm. Thank you. 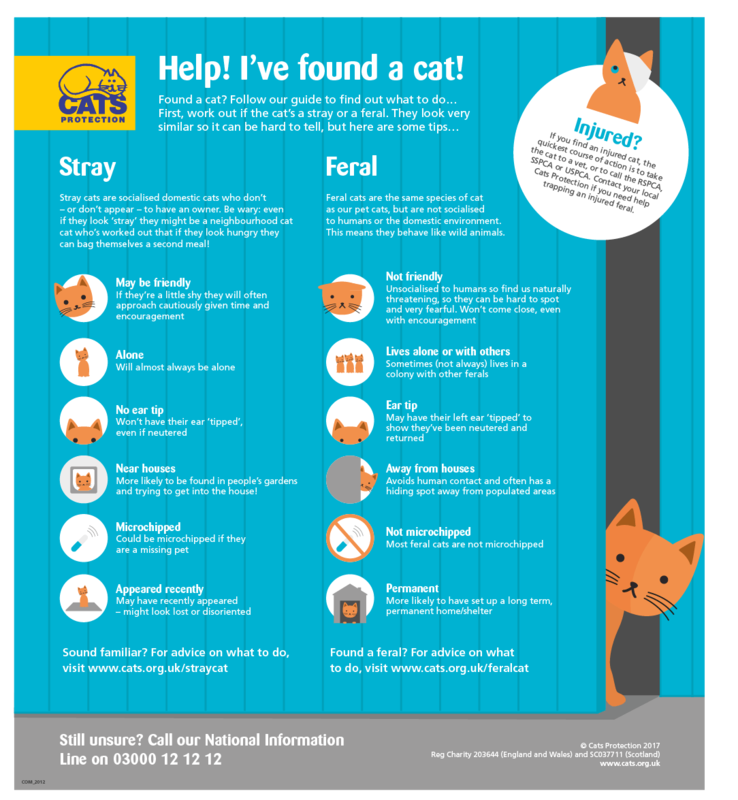 Our visual guide will also help you tell the difference between lost cats, found cats and feral cats.